From over 100 schools who participated in Signals of Spring our first full year, we CONGRATULATE this year's Winners! 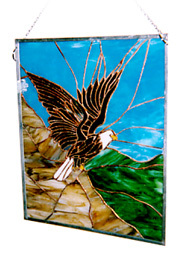 Overall Grand Prize is a stained-glass window piece of a Bald Eagle created by Linda Knight and a $75 U.S. Savings Bond. 1st and 2nd Prize winners for Grades 5-8 and High School will receive a $50 U.S. Savings Bond. The Shadow is the most original use of metaphor and sustains that metaphor throughout the poem. It is very interesting to look at an eagle using the shadow on the ground. Eagle In My Eye represents a sustained use of traditional poetic form in terms of rhymed couplets. Also the poem has an interesting twist in the last stanza, in that the eagle is described as becoming an eagle in the poet's eye. As you glide on the clouds above. Wisdom is written in your eyes. You have claws of steel, or so I've been told. You're a symbol of peace yet a symbol of war. You become the Eagle in my eye. The Soaring Eagle is a well done social commentary poem. Until we notice that the soaring eagle has gone away. New Orleans writer Kalamu ya Salaam is founder of Nommo Literary Society, a Black writers workshop; co-founder of Runagate Multimedia; leader of the WordBand, a poetry performance ensemble; and moderator of e-Drum, a listserv of over 1000 Black writers and ethnically diverse supporters of literature. His latest book is 360° -- A Revolution of Black Poets edited with Kwame Alexander. Salaam's latest spoken word cd is My Story, My Song. He is a 1999 senior literature fellow of the Fine Arts Work Center in Provincetown, MA. The Magic of Juju -- An Appreciation of the Black Arts Movement is forthcoming from Third World Press.